These are the latest blog updates. Click on the title to read the full article. More regular updates can be found on the Twitter Feed and the Message Board. In case there was any doubt, I am most definitely living in the south again. 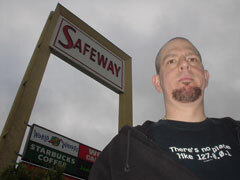 There are no more Safeways in my world, and nothing resembling an Albertsons or a Ralphs. I’m finding groceries to be considerably cheaper and the whole experience of shopping to be much more pleasant than in California. 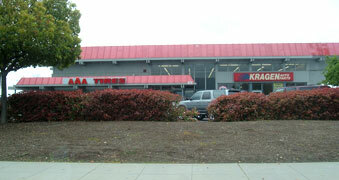 Stores are big, and properly stocked and staffed. You can actually find bread even on Sunday nights. But I promise to find any interesting ones and let you know where they are soon. 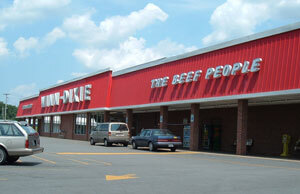 I’ve been trying to shoot lots of Winn-Dixie stores before there aren’t any in the area anymore. The one pictured above is in King’s Mountain. I’ve also done the first bit of my Charlotte research and have compiled the list of addresses. If you’re really interested, I’ve put up a quickie HTML version of the spreadsheet here. It’s going to be interesting to see what is and isn’t still here in Charlotte, a city notorious for destroying almost everything old. It’s officially all over for the Alma Plaza Lucky now, I suppose. It was scheduled to close on Thursday, and I made it by for a few final photos last Sunday. I’m definitely sorry to see this one go. I’ve been busily organizing all my assorted newspaper and magazine articles into a Filemaker database lately, which means I haven’t really been working on the site very much. But it should make later updates (and the long-pondered book) much easier. In addition, I’ve been trying to get all the Northern California photos I can before leaving the Golden State forever at the beginning of June. Suggestions are welcome, as are pointers to things I should see on the road back east. Our stops are tentatively planned for Palm Springs, Phoenix, Austin, Houston, and New Orleans. We may also take breaks in El Paso, Atlanta, and/or Jacksonville before arriving in Groceteria’s new home of Charlotte NC. I’m happy to say that a reader has confirmed that this Pavilions was originally a Safeway-Super S combo, as I’d guessed. He also adds that his “childhood recollection, however, was that they didn’t use the Super-S name in Southern California but called them ‘Safeway Variety Centers’ instead.” Anyone care to confirm? With that mystery solved, does anyone have a clue what the heck this thing might have been? 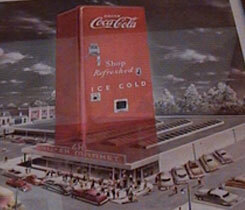 It looks like maybe some chain discount store prototype, but it could have been a supermarket as well, I guess. 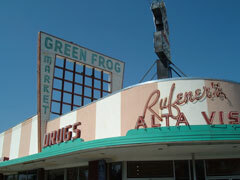 This particular example stands on Mooney Boulevard in Visalia CA. It doesn’t get much better than this one, does it? It’s from my just completed whirlwind weekend supermarket tour of Bakersfield, finally shooting some of the stores I’d added to my database several months ago. I’ll post the photos later in a ne section which will compete the Central Valley Trilogy, but I figured I’d better hit the town this weekend, since I’ll be leaving the west coast for good in a few months. 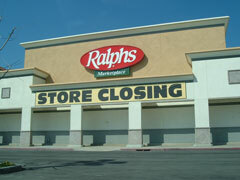 As luck would have it, I was also in town for the last weekend of Ralphs in Bakersfield. 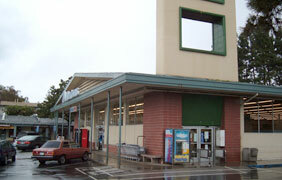 Save-Mart is taking over two of the three stores, adding yet another chain to the collection of prototypes it has in its collection of stores. Anyone want to hazard a guess as to whether or not this Pavilions unit in Seal Beach might have originally been a Safeway-Super S combo? It has a matching Sav-on drug store next door and the whole thing really looks like it was originally meant as one integrated building. 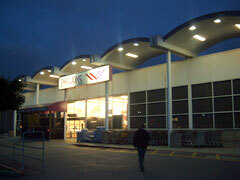 Either way, I’m pretty sure the Pavilions was originally a Safeway store. 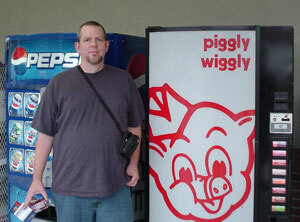 Via a link in the message board, I found yet another useful searchable image archive, this one from Seattle. 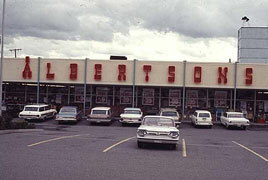 The cool Albertsons photo above came from it. Also found a set of really nice images from a 1952 Grand Union in Patterson NJ at some Library of Congress site for which I’ve misplaced the URL. For those of you who are address and date nuts, you may be excited to see that I added this list of all 1973 locations to the Alpha Beta section today. 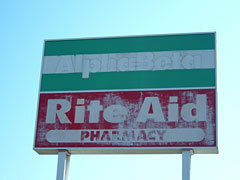 It’s interesting stuff and I did a little limited cross-checking o see how many stores in Southern California were still operating as Ralphs locations, and how many in Northern California had lasted long enough to become Albertsons branches. So I’m experimenting with adding a web journal to the site. I don’t use the term “blog” because it sounds like something you might hack up on a very hungover Sunday morning. In theory, I’ll use this space for links to interesting sites and news articles I’ve found, pictures of stores I need help identifying, pointers to new stuff on the site, and general notes, comments, and thoughts.